This photo was taken while hiking along the Blackwater River during our camping trip to Blackwater River State Park in Holt, Florida. It was such a beautiful, lazy river; we loved stopping along the banks to enjoy the views. I am joining Ruckus the Eskie for Sepia Saturday. Do you have a great sepia-toned photo to share? If so, link up to the Hop! That is a beautiful place Oz, you are lucky to have been there. It was such a peaceful river, Miss JoAnn. Very lovely. wandering along the river banks is always fun. So true! There are always great smells to catch in the air! What a nice picture. We've never been to a river. You've never been to a river? Why do your humans make you live such a sheltered life? Love the quote Oz. Have a super Saturday. Thanks Molly. I thought it went well with the photo. That picture makes us want to sing that Old Man River song. WOW! what a GREAT photo! love your blog as well!! Woof-hoo! Thank you Madi girl! I love your photo and I love the quote. A river runs through our city, and it draws us to it. There's a wonderful network of trails on both sides. We, too, could be busy for months on its banks. Hope you have a lovely Saturday! Thanks Garth! I love walking along the banks of the river...as the seasons change, so does the scenery along the bank. We are #14 in the hop. Come on by! Me, too...I could join you! I love you sleepia toney photo. Very nice. Hello Oz, You have a very beautiful photo today! Should we feel guilty being in the south where it is NOT snowing this weekend? LOL! Um....I don't know...it is raining, so it's not like we can do much anyway. Must have been a fun, fun day! Gorgeous and I love the quote! That photo is so cool Oz! It looks very old-timey! Such a cool picture Oz! Looks so relaxing! My Dad loves anything to do with water, like rivers, beaches, boating. Me, I love to drink it but I sure don't want in it. Pretty scene Oz! Thanks Brian. I am with you, I don't want to be IN water either though I love to walk near it and canoe on it. Great photo Oz - and great scenery too! Thanks. I love hiking along the river. Thanks Pepper! This is in the State Park up by you! Oh, Savvy...I will miss you while you are gone! let me know when you are back! SEPIA SATURDAY?? Oh how cool! Is this a blog hop every Saturday?? I thought there was only Caturday blog hops. I love the look it gave the photos! I want to join the next one. YES Carma! A Saturday blog hop for everyone, not just cats. You should join next week! That's a great picture, Oz. Sepia Sunday sounds great! Hi Meghan. 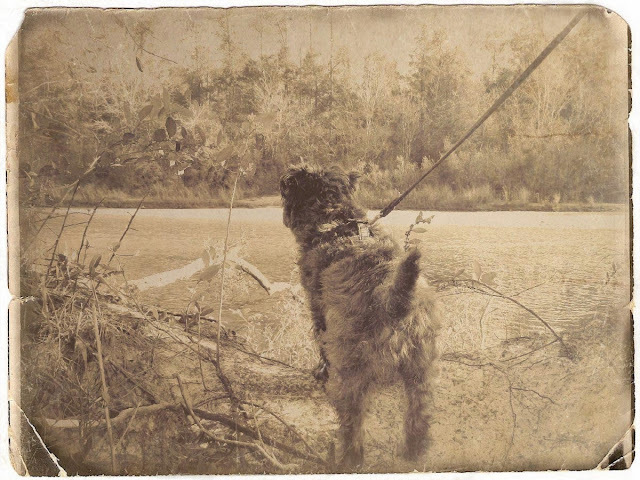 The sepia tone and frame came from a website I use Art.Pho.to/# You can create all kinds of effects on photos there. Wonderful photo! How are you all getting that old-time sepia look? Dawn - Art.Pho.to/# website (no http or www). There are several cool affects you can make to a photo there. Great photo and LOVE the quote! What a great standstill photo Oz. It really captures the calmness of the water. 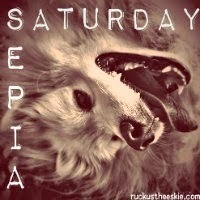 Thanks for linking up to my bloghop Sepia Saturday! I'm still going around making my visits to all the linkups! Thanks Ruckus! And thanks for hosting the blog hop! I love it! Oz, what an amazing photo. It really looks vintage, and you have so much personality that it shines through even from the back, while standing still! Thank you, pals! And Happy New Year to you too!